Ecuador lies on the infamous Ring of Fire and is home to over thirty volcanoes, many of which can be hiked, climbed and summited. Volcanoes on the mainland are all high-altitude destinations and require a healthy respect for potentially dangerous conditions, while those on the Galapagos Islands are barely above sea-level. No matter which volcano you choose to visit, the vistas are stunning as the Ecuadorian landscape provides ever-changing views from constantly passing clouds. The second-largest volcanic caldera in the world is on the island of Isabela in the Galapagos Archipelago, the Sierra Negra Volcano. A muddy hike up hillsides covered with guayaba trees leads to a viewpoint overlooking this 60-square kilometer crater. No photo can do this place justice as even the widest angle lens distorts the true distance across the black and orange lava beds. One of the most spectacular views to be had on the Galapagos Islands is while standing on the edge of the Chico Volcano on Isla Isabela. It requires a full day hike – often in hot, sunny conditions with little shade, through a bizarre landscape of volcanic remains in a palette of earth colors, rust reds, ochre yellows and deep charcoal black. But the reward is a vista of the unpopulated parts of Isla Isabella, including the Wolf Volcano, across the water to the neighboring islands of Fernandina, Rábida and Santa Cruz. This hike is normally combined with a day trip to Volcán Sierra Negra. The 2015 eruption of the Cotopaxi Volcano caused panic in the local area. The mountain is still spewing vapor and fumes every few days but calm is the order of the day. While it is not permitted to summit Cotopaxi, nor to climb its easily accessible glacier, it is possible to hike the volcanic landscape to the Refuge and enjoy the incredible views of the valley looking towards Quito. Intrepid mountain bikers enjoy careening down these slopes on pea gravel and ancient ash. More sedate travelers might appreciate a horseback ride on the paramo. If you visit the Swing at the End of the World just outside of Baños, Ecuador, then you are on the slopes of the extremely active volcano, Tungurahua. Despite its frequent eruptions, the volcano has failed to disrupt life in the region. In fact, locals have learned to ignore the frequent ash and bellowing noise and the local government has built bridges and roads to pass over the potential lahar flow if the volcano does erupt. In the meantime, tourists are free to pay a visit to other destinations on the mountain like the luxurious spa, Luna Runtun, the little-known farm of Panticucho and the swing at the Casa del Arbol. Just outside of Quito lies the small farming community of Lloa, gateway to the active volcano Guagua Pichincha. While some visitors embark on the hike from town, others hire a local guide to drive them to the Refugio. From that point, it is a 30-minute hike to the crater rim. On a clear day, most likely in the dry season of late July through early October, it is possible to see fumaroles spewing vapor and gas into the atomosphere. Continue on the trail to the right to hike to the highest point on Guagua Pichincha or take the trail to the left to visit the shrine of the Virgin of Cinto. El Altar is an extinct volcano that lies at the heart of the Sangay National Park. The mountain is actually a series of nine peaks, all named after titles in the Catholic religion, like bishop, friar and nun. For the adventurous and fit traveler willing to embark on a three-day hike, it is possible to stay overnight at a refuge run by the Hacienda Releche. 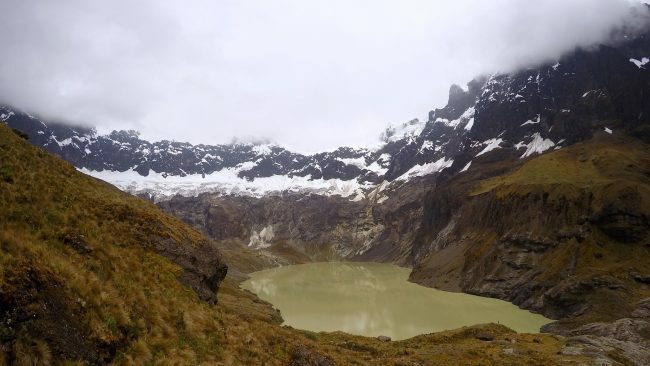 Most visitors head to the gorgeous views to be had at the crater lake while very few attempt to summit the most technical peak in the Ecuadorian Andes. The stunning blue water of the Quilotoa Crater attracts thousands of visitors every year, but few venture past the viewpoint. The traditional hike is a straight shot to the water’s edge with a donkey ride back top. Break convention and hike the crater rim instead, a seven-mile full day hike with unique views of the crater and the surrounding valleys of Tigua and Chugchilan. International alpinists come to scale the peak of the Chimborazo Volcano because it’s the highest mountain in the world when measured from the center of the earth rather than by sea level. It’s also popular for beginning mountaineers, as the trek requires little technical climbing experience and the summit is obtainable for intermediate skill levels.